One of my oldest and dearest friends lives just down the street from me. Bienvenue à la Maison Claire. Claire describes her home as a “Beach Cottage” built in the 1950’s. studied in Paris has greatly influenced her beachy style. gracious, comfortable and elegant style. This is her living room/family room. She loves a neutral palette and it always feels current. Newport Beach. There are nautical motifs throughout their home. Claire has this gorgeous kitchen and hates to cook! She remodeled this a few years ago. (Wish she had taken before photos). But she knows where the best take-out is and count on her to make fabulous appetizers. The kitchen nook is a favorite spot for her family and friends to gather. I could not get a lighter shot! All that California sunshine outside! The view outside her kitchen window. We are lucky here to get the ocean breezes and have few insects. This area (formerly the smaller kitchen) is Claire’s office. She designs jewelry using new and vintage pieces collected from flea markets. Claire has made some of my favorite jewelry. This is a little jewel box of a powder room. (along with the mirror) and added the marble top. See my hand by the orchid…busted. I love where the full length mirror is positioned (I suggested it, remember Claire?). Isn’t her daughter’s room darling? 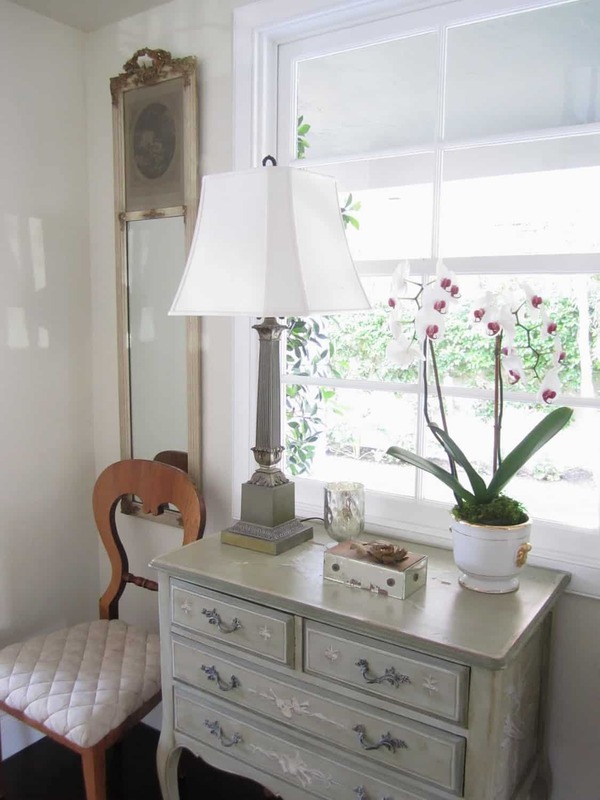 Claire did such a great job mixing new with vintage finds. 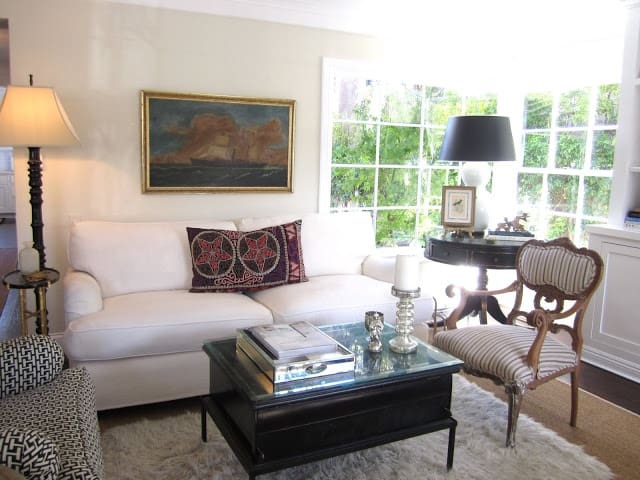 I love the hanging lantern and the seahorse table. So unique. 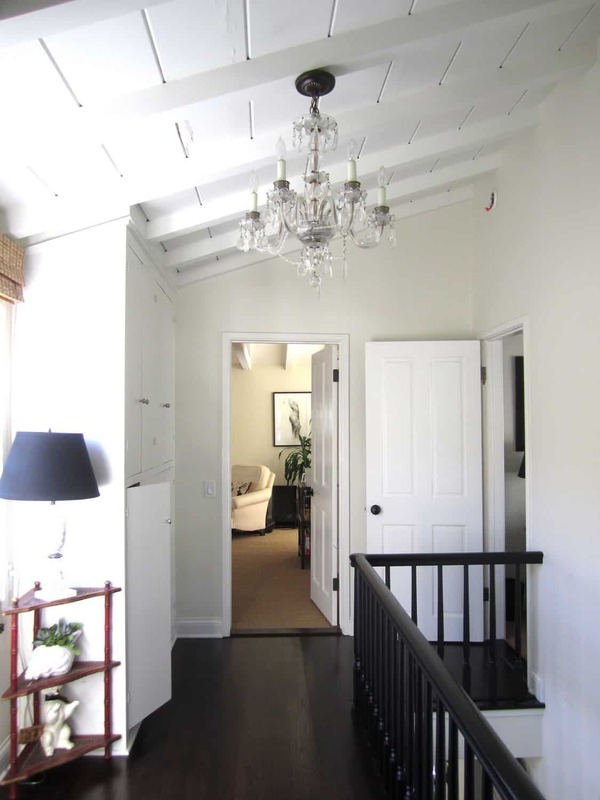 Here, in the upstairs hall you get the beach cottage feel but with the elegance of a crystal chandelier. The above photos flank the front door. I love that sweet quilted chair on the left. 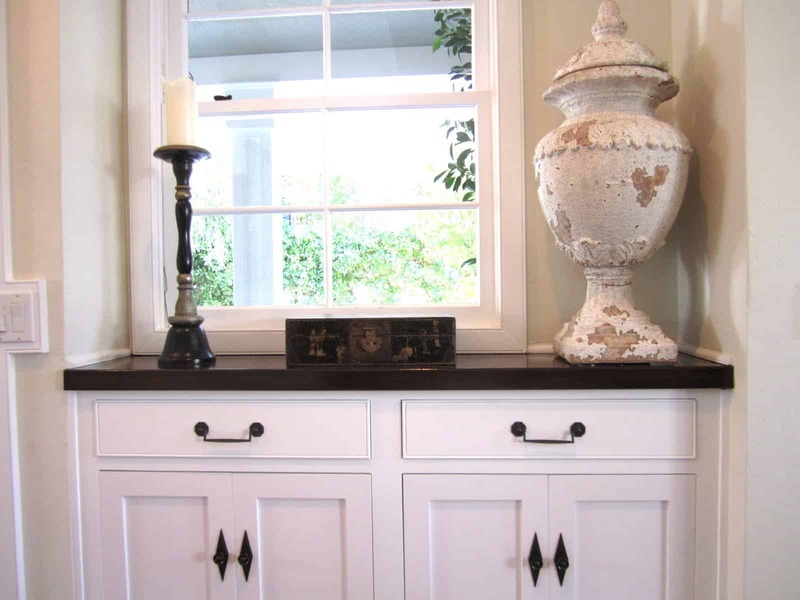 The handles and knobs on the built-in on the right are from an antique hardware store. Nice way to add character to a new piece. I love Claire’s style and “je ne sais quoi.” How about you? 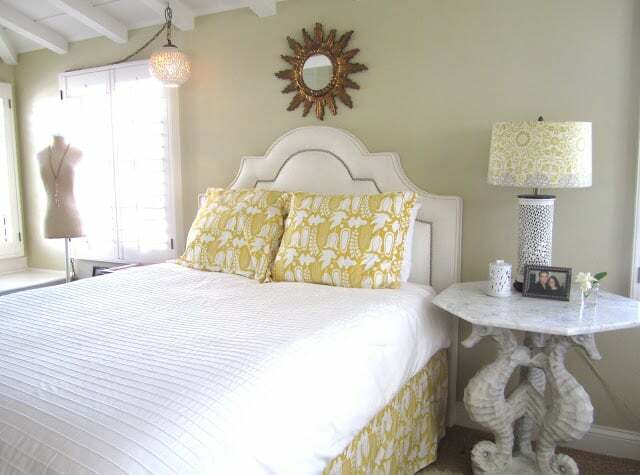 Thanks so much for sharing Claire's stunning beach home…love it! She has a fabulous home. All the little details and touches are wonderful. I especially love her dining room and the slipcovers on the chairs. Very pretty! This is AMAZING! thank you soooo much for the home tour! She's very talented. What a wonderful home tour. Her home belongs in Coastal Living magazine. Just gorgeous. Claire could certainly go into the design business:) her home is amazing. I can see how you two are friends. You have so much in common taste wise. I wonder if Claire would mind sharing her paint colors, they are beautiful . Amazing! Love the mix of old and new. You both have similar taste. Thanks for sharing with us. Hugs! I adore everything about your friends house! I love the details throughout! The chandelier upstairs…brilliant. The diamond shaped hardware on the built in…makes it look like it has been there forever. Love the gorgeous mirror as you are going up the stairs. I could go on and on, but this is one house I'll be coming back to for ideas. One more thing…love the rectangular pillows on the sofas. Claire has such a beautiful home! Thank her for sharing it with us. I love getting good ideas from everyone. This is one of the pretiest "real" houses I've ever seen! I seriously LOVE this house. She has terrific taste! What an amazing house. 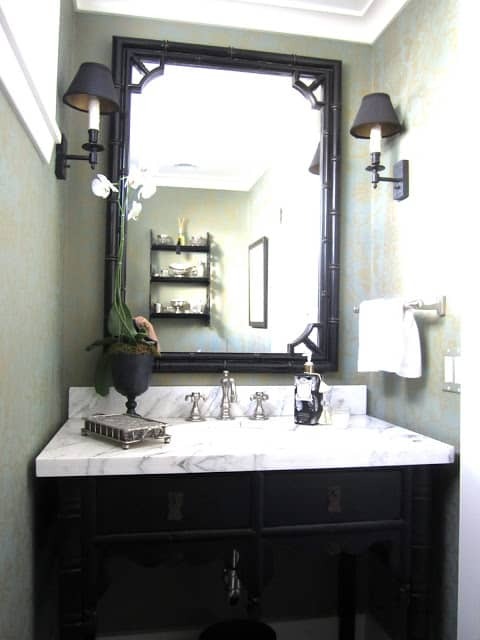 That gray chest, the office, the kitchen, the powder room are all perfect. Any idea what color the office walls are? This is a truly beautiful home! Your friend has an amazing eye, and excellent taste. WHAT a beautiful home. Thank you so much for sharing it with us Mary Ann! 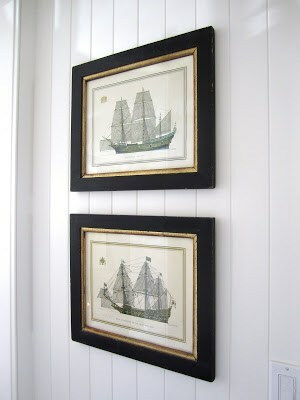 You and your dear friend share a great eye for style…..I love both your homes. The details in Claire's house truly make it….I am a big fan of the neutral palette layered with interesting furniture and character. 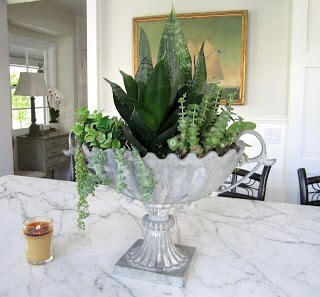 Thank you for sharing your friend's home…so beautiful and just my style! 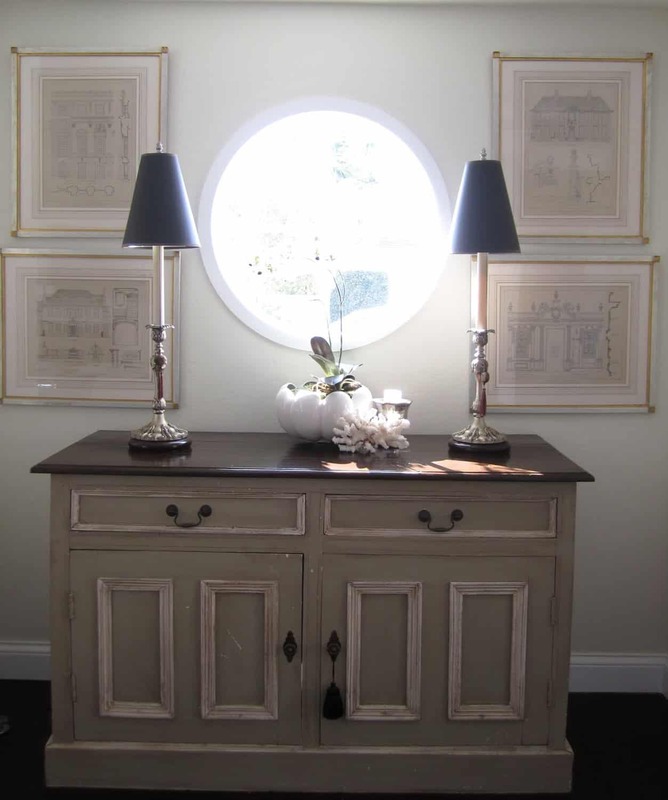 (I have always described my style as "French Country Coastal"). It's great to have friends that inspire us! Gorgeous all of the way through. I hate cooking too, but I think I might like it in that kitchen. Your friends home is fantastic! I absolutely love it! Beautiful style, beautiful taste. I noticed so many things that we cannot get away with here in the midwest like no screens on the windows. Love it! Thank you Mary Ann for sharing this. And thank your friend too! Love those corner windows in the first picture! I LOVE her house and her style! It is absolutely showworthy to be sure. WOW! WELL DONE!!! Gorgeous home! I do not exaggerate when I tell you that TO DATE, this is the most beautifully decorated home I have ever seen!!! I am going to post some of these beautiful photos on my blog. SO SO SO SO PRETTY!!! Beautiful! Please share paint colors!!! What a treat! Thank you friend for letting us stalk your house! Perfectly timeless – I could move right in. Her home is magazine ready!!! Oh, la, la!!!! I love every single room. Gosh, she has great taste! Actually, classic taste, which is even better. What an absolutely gorgeous home!!! What a relaxed and elegant home. Thanks so much for this tour – loved it! What a beautiful home! The kitchen is just gorgeous! I love the restrained palette, and her mix of textiles for texture is perfect. 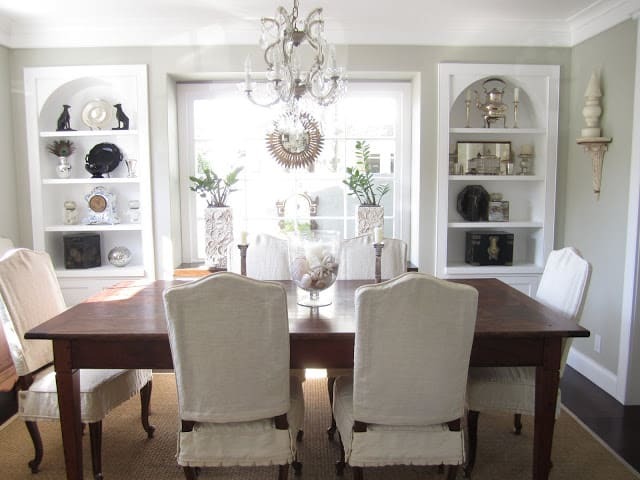 Love the dining room slipcovers! Those buttoned, pleated skirts are just darling! Thanks for sharing. 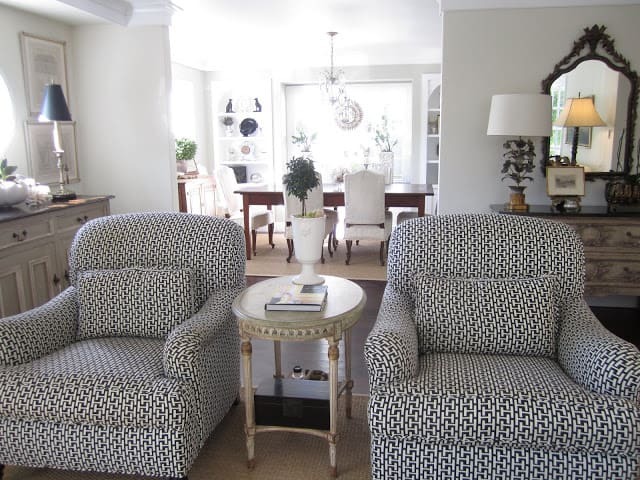 Would you happen to know more about the fabric on the two chairs in the living room? The stairs are great, and I love the kitchen and office. The entire home is gorgeous! Wow, her home is absolutely stunning! This is my idea of a beach house! I really feel so relaxed just looking at the photos. 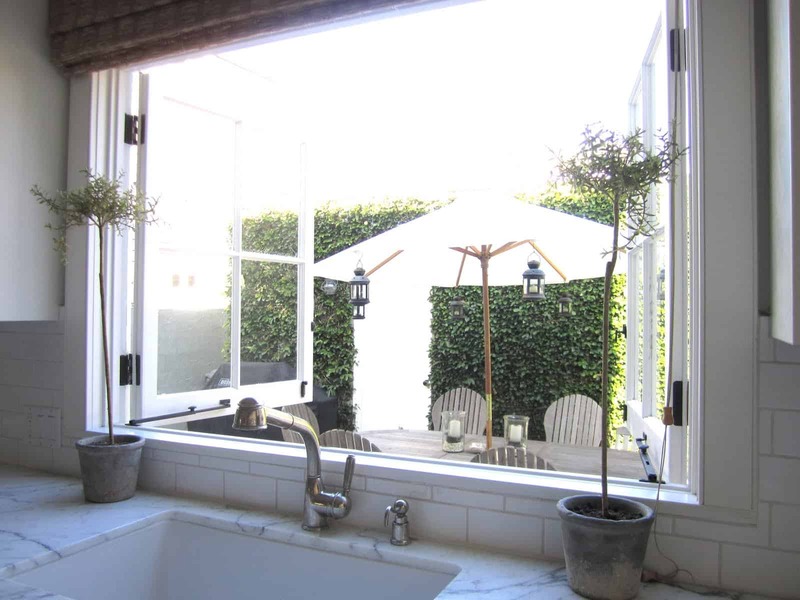 I love how her kitchen window opens right up to the back. It all is so lovely! I will ask Claire about the paint colors when I get home tomorrow. (Up in the mountains) and do a follow-up. Thanks everyone…Claire is even prettier than her house! Her house is beautiful! 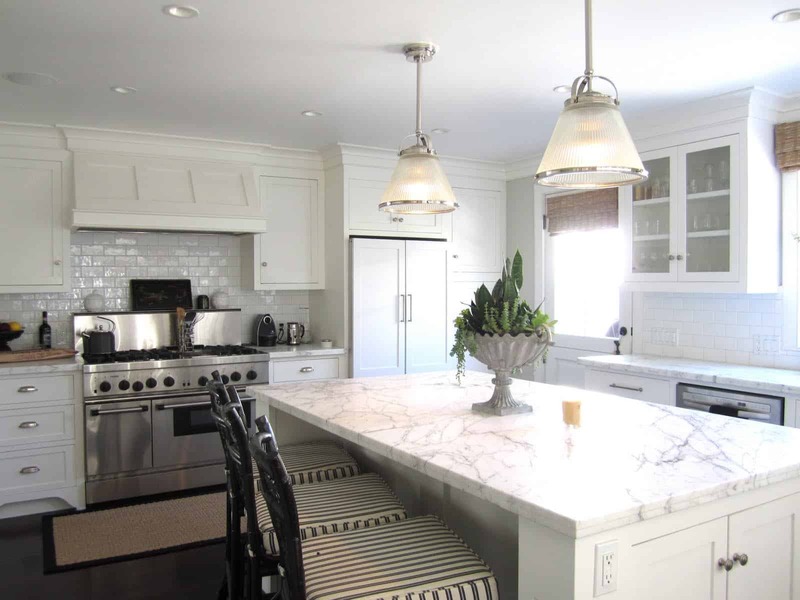 And the white kitch….someday! 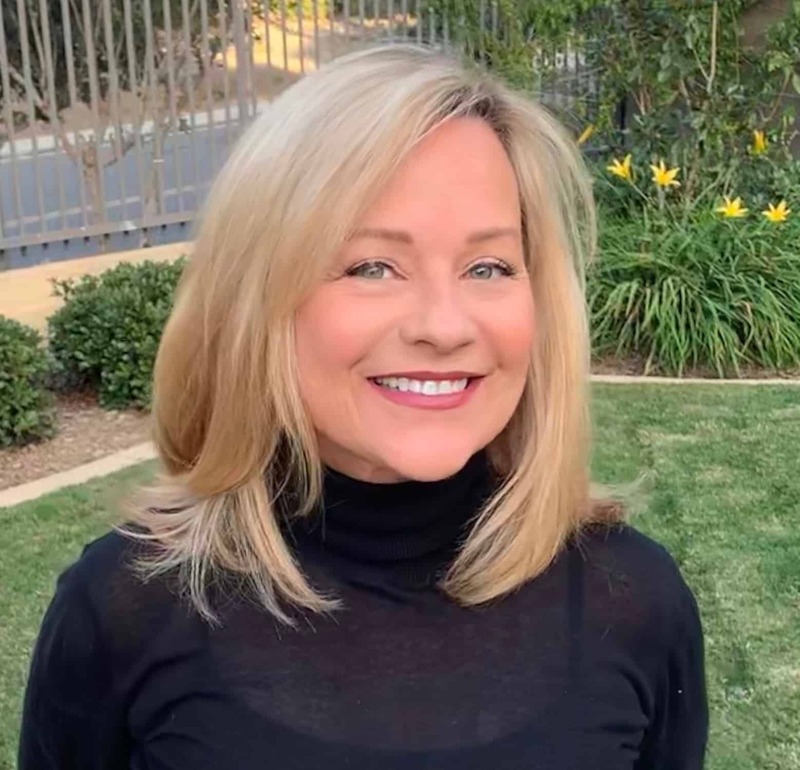 Mary Ann thank you for visiting my blog, I'm now a follower of yours. And thanks for the memory of my one beach-bum summer in NB about 25yrs ago! I rented an apt on River Ave and worked at NB Country Club. Good times! So elegant, yet warm and tastefully done. I love the mirror on the stair landing and the beautiful marble countertops in the kitchen. Oh my goodness….this house is absolutely stunning!! The kitchen, office and powder room are amazing! Thank you so much for sharing! What an absolutely stunning home! 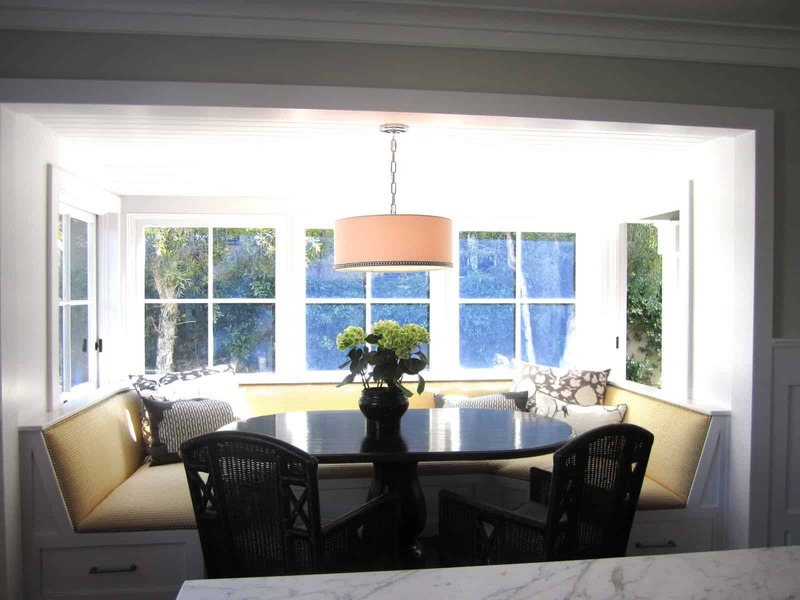 I love the banquette seating and how the kitchen windows open out to outdoor seating. Dream home for me! I can see similar taste here!!! Love the black and white with soft grays. 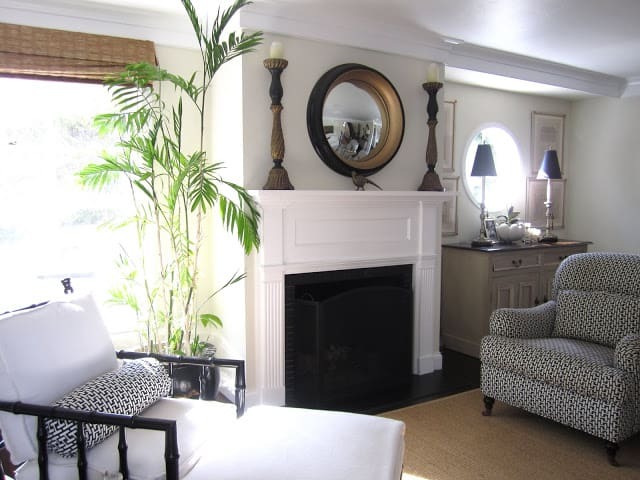 She has done an outstanding job making monochromatic look warm and inviting. I had to pin quite a few of these. The photographer 🙂 did a great job also….. I could walk through houses all day everyday. This one is exceptional love all she's done with her home. Very chic! Great post Mary Ann! What a truly beautiful home – you and Clare definitely have similar taste and talents!! Each room is truly stunning!! I always love reading your blog Mary Ann … you always have something fun and interesting to read about and it always fires up my creativity!! Au courant, bien sur! Thank you, Claire, for allowing Mary Ann to share with us! Your home is so simple and very beautiful. I am a 'gatherer', too but I keep it all. Do you sell your cast-offs?? I grew up in NB and I live close if you do!! LOL! A huuuuge thanks to you Claire, for sharing your absolutely BEAUTIFUL, comfy & magnificently personalized home with us… and OF COURSE, to precious & oh-so-talented Mary Ann for featuring what she knew ALL of us would absolutely love… KUDOS!!! B*O*T*H of you have truly made such wonderfully lovely, welcoming & unique homes~~~ color schemes, so subtle, just "float my boat", and the EDITING and SCALE are SUPERB!!! Many SINCERE THANKS for "everything"~~~ such a DEEEEELIGHTFUL tour! Thank you for sharing this gorgeous home with us. It is classic and timeless. I lover palette of soft neutrals with a touch of black throughout. Her home is gorgeous! I love the kitchen nook banquette area. I could sit there all day! 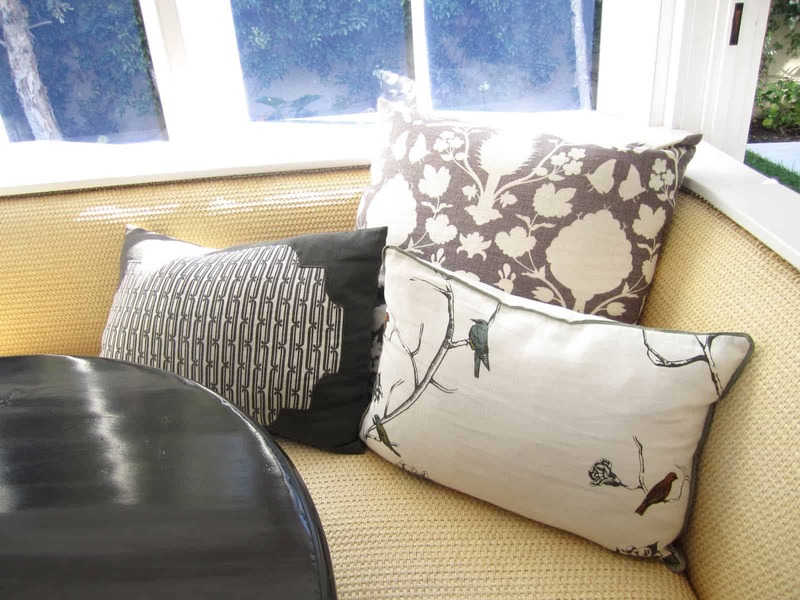 And the slipcovers on the dining chairs are beautiful! I also love the seahorse table in her daughter's room. Thanks so much for sharing! Claire's home is stunning…thanks for the tour! Oh wow what a beautiful house!! It's all so perfectly carried out, and I love the kitchen seating area. The seahorse side table is amazing, and the home definitely looks "no expenses spared". What a great job she did! What a beautiful home! This looks elegant, yet friendly. Nothing "cold" about this cottage. Thanks for your kind visit to my table last week — I'm just getting around after the "visit" from Irene this weekend. Claire's home is beautiful! It's elegant and classic yet it feels current, comfortable and relaxing. 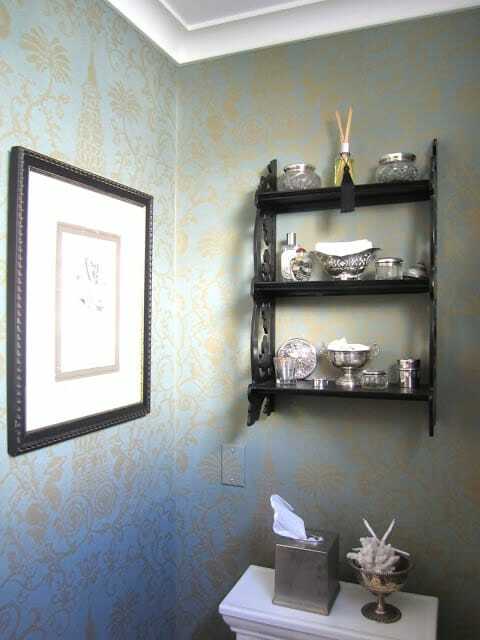 My favorite rooms are the powder room, the kitchen and the dining area. Great tour. Thanks for sharing with us, Mary Ann! Love these photos. Beautiful home. 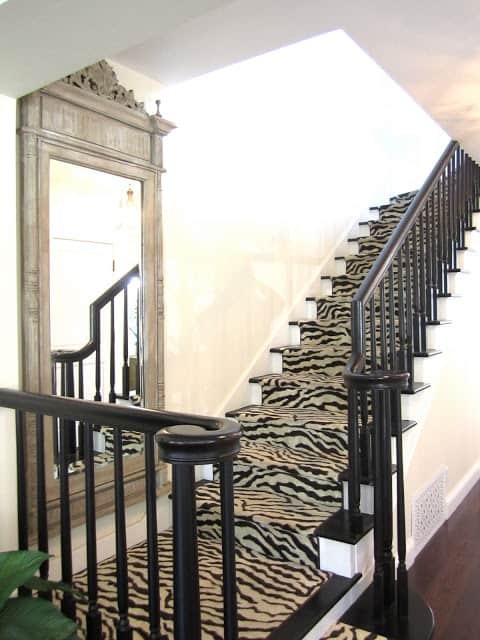 The animal print stairs are great!! You had me at "California French". What a fabulous home…adore the kitchen and her office space is wonderful!! 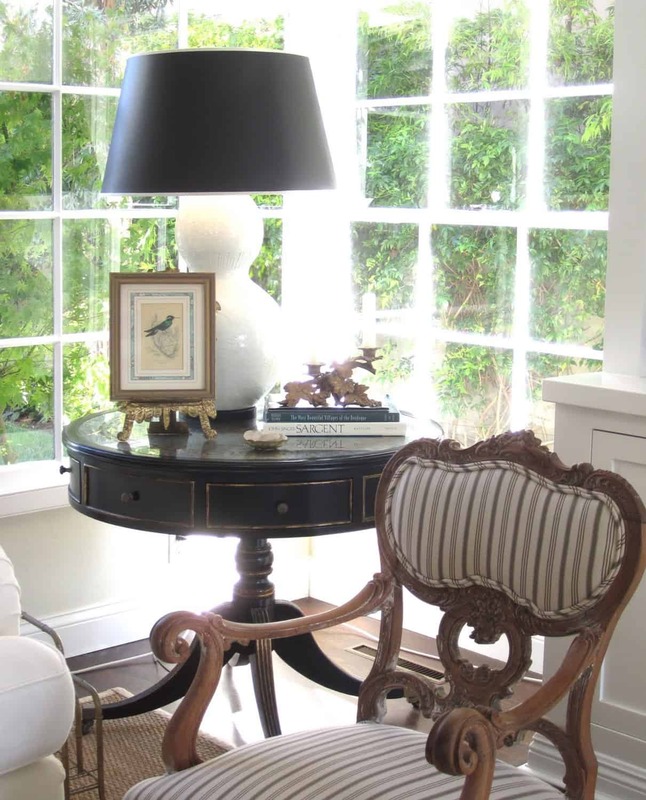 and love the French style that is so vivid in this lovely house. I love those images, it is so inviting and cozy…I really enjoyed this interior design subject and the layout is so lively, especially the kitchen, simple and clean, living room as well. Has Joni from Cote de Texas seen this home? Wow this is just fabulous!! 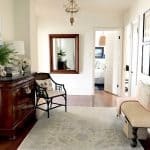 I am most impressed, she has great style, love the dining room, the banquette, the bedrooms, the kitchen, its all so stunning. Yes I do see and feel the French theme which is combined beautifully with a coastal vibe. Stunning, thanks to you both for sharing!!!! So great to be back in blogland! This home is so Stylish and peaceful. I especially love the black and brass mirror over the fireplace and all of her lighting choices. Thank you for sharing!! Popping in from "open house" and thrilled to find your blog. Claire has a gorgeous home with incredible style. She truly has an amazing eye for beautiful details. It's definitely elegant beach house style. Thank you for taking us on a your. Wow! Claire's home is magazine gorgeous, she has great style. I enjoyed seeing it, thanks for sharing. That is a gorgeous home, absolutely beautiful! Claire has great style. I love her kitchen best. The professional range, the marble, the island, tdf! Claire has a refined eye for style. 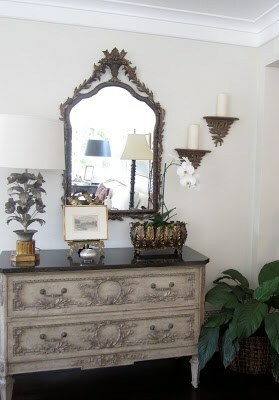 I like how she mixes new items with vintage/antique items. It makes a room much more interesting than everything being new or old. Thanks for sharing her room with your readers! There is such a fresh and calm feel in this lovely home, yet the colors and style is so dramatic! Just breathtaking. Thank for friend for opening her home and thanks to you for sharing! I found so much inspiration here! I am in love with this home…her palette is the same is mine but the way she has edited is so perfected….she has a great eye and I am ready to move my furniture around and paint again!!! Thanks so much for sharing her home with us all. It's all wonderful but the dining room is just stunning. Thank you so much for sharing and coming to the party! Gorgeous with a capital G!!! I adore her cottage- what a wonderful warm and welcoming home!! Sharing on Facebook~ Thanks for sharing this at Feathered Nest Friday! Thank you for the tour…I'm going back to take it again so I don't miss a single detail! That is the most beautiful marble I have ever seen in my entire life! just love the kitchen banquette and the gorgeous kitchen window overlooking the patio! have a great weekend! This house is so beautiful. 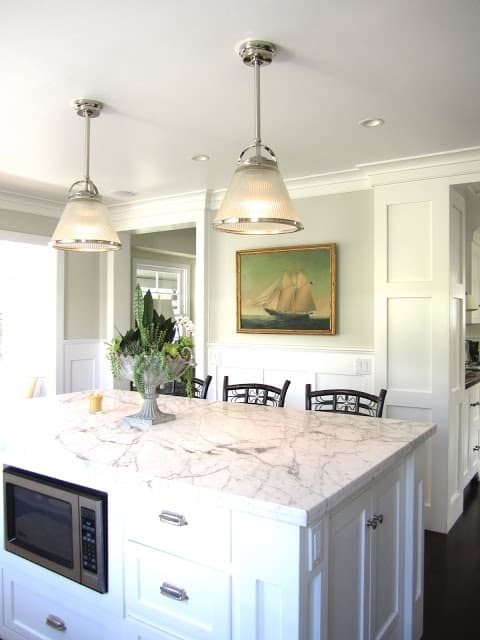 I love the white marble table top in the kitchen and the dining room looks like it was made for royalty. What a lovely home! 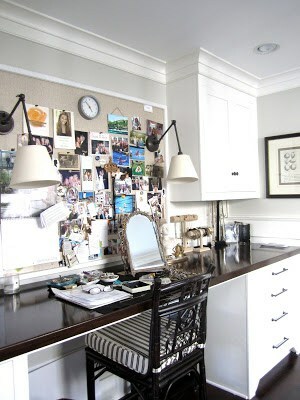 I like every room in her house but especially her desk area and the powder room! I too pinned a few of the images! 🙂 Mary Ann, you and your friend must have tons of fun together…both with impeccable taste and style! Love the CA beach feel….oh how I miss it! Oh my goodness, I've never seen this! Unbelievably gorgeous at every turn! There isn't one single thing I don't like! Beautiful!! Beautiful!! Do you by chance know who the lights/lamps are in the office (the swing arm sconces)? Love the chandelier in the hallway. 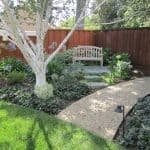 Some beautiful designs and ideas to think about. I love this home. Fantastic tour. 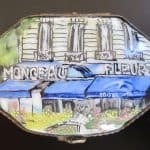 I love the antiques! I'm sharing with my readers , tracking back to you. Oh wow,it's definitely so gorgeous..!! Lovely to see this post,it just so nice or also their luxury interior looks so beautiful..!! I'm glad to see this post..Thanks..!! 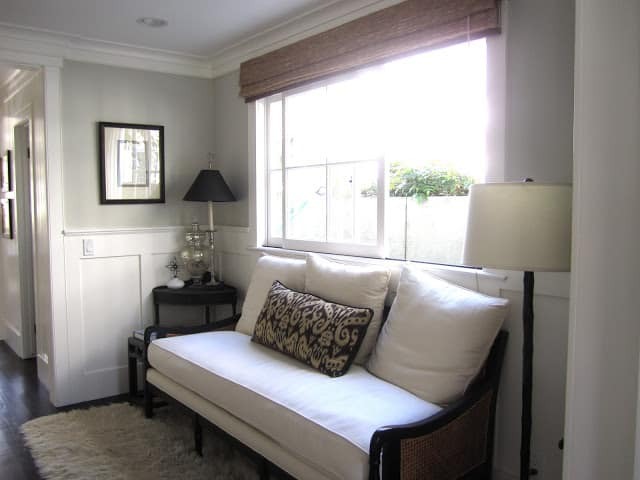 I simply love the wicker daybed or wicker sofa with the white over stuffed pillows. It looks so inviting. I am looking for a daybed exactly like this and would so appreciate any info you could share on it. Thank you. Where can I buy Claire's jewelry? I will ask Claire if she is still selling it and let you know. Where can I buy Claire's jewelry? If it's half as beautiful as this home it must be gorgeous!